Like many I have increasingly found the policies of all three of our main political parties to a greater or lesser extent unappealing. Frequently they seem to offer more of less the same polices perhaps presented in a slightly different way. This book explains why. They are all deeply wedded to the "neoliberal" economic consensus that has gripped us since the Thatcher/Raegan governments introduced it at the end of the 1970s. Rather obviously and spectacularly this economic system collapsed in 2007/2008 and we are still in the midst of a major crisis as a result. That much is clear and this book provides an excellent, clear and accessible analysis of this situation. If that were all it did it would still make a good read but what I think makes this book more important and interesting is that it does not simply explain what the problem is but actually tries to set out a solution. The economic crisis we are now facing is the legacy of Thatcher and Reagan because they introduced into government the neoliberal idea that whatever a politician does, however well-intentioned that action might be, they will always make matters worse in the economy. This is because government is never able, according to neoliberal thinking, to outperform the market, which will always, it says, allocate resources better and so increase human well-being more than government can. That thinking is the reason why we have ended up with cowardly government. That is why in August 2011, when we had riots on streets of London we also had Conservative politicians on holiday, reluctant to return because they were quite sure that nothing they could do and no action they could take would make any difference to the outcome of the situation. What began as an economic idea has now swept across government as a whole: we have got a class of politicians who think that the only useful function for the power that they hold is to dismantle the state they have been elected to govern while transferring as many of its functions as possible to unelected businesses that have bankrolled their path to power. This (as the book actually mentions) was the kind of thinking that got us Suffolk County Councils' "new strategic direction" when the council planned to turn itself into "virtual" council by outsourcing pretty much all of its services. This collapsed demonstrating an interesting tension between traditional Conservative thinking, still quite prevalent in Suffolk, and neoliberalism. 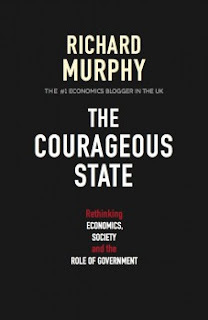 A Courageous State is populated by politicians who believe in government. They believe in the power of the office they hold. They believe that office exists for the sake of the public good. They know what that public good is. They think it is their job to help each and every person in their country to achieve their potential – something that is unique to each person and which at the same time is a characteristic we all have in common. And they believe they can command the resources to fulfil this task – whether through tax or other means – and that they should command those resources so that we as a country can each achieve, both individually and collectively. The book contains a detailed set of practical policy suggestions that such a courageous state could follow to get us out of the mess we are currently in. Murphy himself is an interesting person. He runs a well known blog called Tax Research UK and his background is as a chartered accountant and economist. He has a great deal of practical real world economic experience working with companies in what he describes as the "real economy". As a consequence the book is practical in a way work by more academic economists frequently is not. A big part of this agenda is controlling and reducing the "speculative" economy of the City and big finance which he describes as operating in a kind of parallel universe to the real economy and frequently acts counter to the interests of that real economy. You can read a longer extract from the start of the book on Richard's Blog. 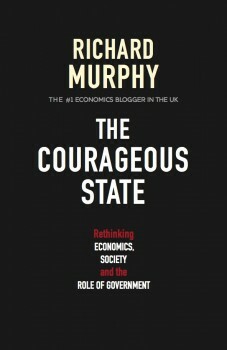 The Courageous State is available from Amazon at £7.15 for the Kindle Edition and £14.99 for the Paperback. I recommend the book highly, it is interesting, practical and an important contribution to building a new kind of politics and economics.